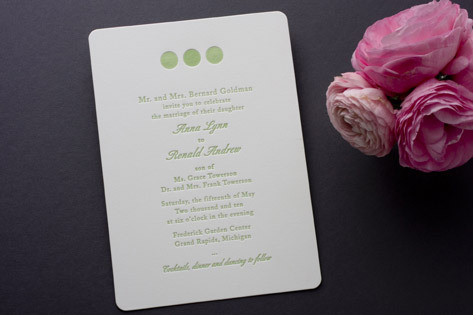 Three lively, letterpressed polka dots sit atop this clean, modern letterpress wedding invitation. A soft white background and rounded corners add to the upscale, modern look. The simplicity of the geometric elements and style of the suite make this a great choice for the modern bride and groom. Available in sage (shown), pink, and sea.